1. Makeup Remover: For makeup removing I’ve been loving The Body Shop’s Camomile Gentle Eye Make-up Remover. It’s formulated for all skin types, including sensitive skin. My skin isn’t super sensitive but I’m always really careful around my eyes, and this gentle formula works really well. And it’s not oily, like a lot of other makeup removers out there that leave oily residue around my eyes that I feel the need to scrub off afterwards. It has a really relaxing light and fresh scent too. It’s always really important to remove your makeup. Please don’t forget. 2. Cleanse: I’ve been using two different cleanser lately. The first is Olay Foaming Face Wash for sensitive skin. I actually picked this one up by mistake thinking it was the Neutrogena Fresh Foaming Cleanser (which I love), but this one has been really great too. I’m not very picky about the brand that I use with my everyday cleanser, but I need it to be a foaming/sudsy cleanser in order to feel like I properly cleansed my face. When I’m travelling I always opt for a more travel-friendly package and for that I’ve been using The Body Shop’s Vitamin E Cream Cleanser. I know that I’ve been going on and on about the Vitamin E line, and this one is no exception. This one is super easy, no water necessary. Just smooth it on and remove it with cotton pads. Like all other Vitamin E products it leaves your skin feeling incredibly soft. 3. Exfoliate: For those days that I’ve been exfoliating (about 2-3 times a week) I’ve been using the St. Ives Green Tea Scrub. The oil-free formula actually helps clear breakouts and refreshes the skin. It feels great!! It’s important to exfoliate to remove impurities and dry/dead skin from your face, but make sure not to do it too often or you will damage the skin that is healthy. The great thing about St. Ives is that it’s hypoallergenic and formulated without parabens. 4. Tone: I always think that toning is an important step for daily skin care. For years I’ve been using Clinique Clarifying Lotion 2. It helps remove any dirt and greasy oils that the cleanser may have missed (although with the right cleanser that shouldn’t be a problem) and over time it helps revitalize skin’s natural renewal process. So skin looks healthy and renewed. 5. Moisturize: And of course the final, and most important step is to moisturize your face. I’ve been using Clinique Dramatically Different Moisturizing Gel for years and I’ll probably never change it. But some days I also use a small amount of Josie Maran 100% Pure Argan Oil for a deep and intense moisturizer. I’ve also been pretty strict lately when it comes to focusing on my eyes. I’m finding that the skin under my eyes is looking more and more worn and tired looking, so I use either Roc Hydra+ Anti-Fatigue or Origins GinZing Eye Cream, which has recently become a non-negotiable staple in my evening skincare routine. Once in a while, for that final spritz of moisture, I’ve been using The Body Shop’s Vitamin E Face Mist for an instantly refreshing moisture boost. 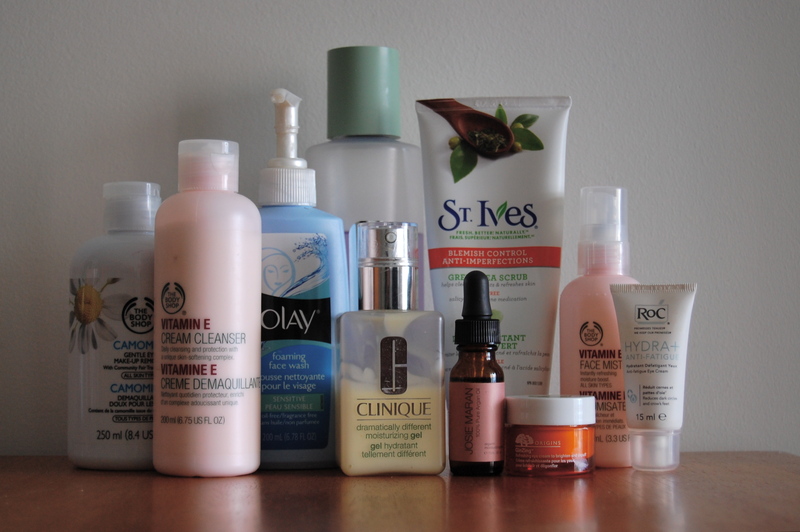 There are a ton of skincare products out there that I really want to try. So I will probably be mixing this up again soon. Of course I refuse to change up the good ones that have never steered my wrong such as the Clinique Clarifying Lotion, Dramatically Different Moisturizing Gel, and the Origins GinZing Eye Cream. What evening skincare products do you love? Any good suggestions for a mask?